Baby Born Onto Bed – OB didn’t make it in time. I started having close and strongish pressure waves that woke me up at about 4am on my baby’s guess date. Not really anything before that. I decided to start timing them and see if they continued. During the weekend I was having a lot of what I thought were early birthing waves about every 10 minutes, but they kept going away. But these didn’t stop and were a bit more intense. I started listening to by birthing day tracks and trying to relax and use my peace cues through the PWs. They were intense enough that it was sorta difficult to do. During every PW while I was sitting/reclining the pressure on my ribs bothered me the most. After about 4 PWs in 15 minutes I woke up my husband to get him to help time them so I could still relax. They were about 2 minutes apart at this point and I had been awake for about 30 minutes. So we started getting ready to go. I was anxious to not jump the gun too early. I didn’t want to hang around triage too long if I hadn’t progressed much. Also thinking, that since they just started and they were strong but not terribly I felt that we had some time. So I took a shower and got ready, he packed up. By the end of the shower I was needing to stop what I was doing more and bend over and lean against a counter or wall to relax and breathe through the pressure waves. So I started feeling a little more anxious to get on our way. We got out the of the house eventually at about 5ish. Luckily my Mother was there already and to watch the other kids. The hospital is only about 5 minutes away, luckily. So we got there a little after 5 and they put me in the triage room to get checked and monitor me. At about 5:30 I was at a 6 and they didn’t take took long after that to put me in a room, while we were getting settled the pressure waves started getting stronger where I felt like I needed my husband for support. I liked to bend over a lean into him with my arms around him while he supported me by my arms. I started needing to make noises as I breathed and soon I started having little pushy urges once or twice. I asked the girl helping us (not a RN, but really helpful as a few times she pressed in on my hips during a wave and that felt nice) to have our nurse come and check me again since I was feeling a little pushy. She finally made it back in (I guess a lot of other women showed up around the same time) and checked me and I was at an 8. This was about 6:30. She tried to put in a saline lock, but I wouldn’t hold still for long as I didn’t want to be on the bed during a pressure wave. A PW or two later, my water broke while I was standing. Then the next one I really started pushing and felt like she was going to come out very soon. The nurse really urged me to get on the bed at this time and I did, the next one I pushed out her head and the next the rest of her. It felt so good to get her out. It was very intense and I know I was fairly vocal and cried out when she crowned. Cara was born straight out onto the bed at 6:37. It was basically just the nurse and my husband who helped me deliver her, the doctor was on his way. He showed up about 10 minutes later. She was a healthy 8 lbs 3 oz and 20 inches long with a full head of hair. It was an interesting/cool experience and I’m really glad I planned to go natural/unmedicated. If I hadn’t I wouldn’t have had time anyways to have an epidural and I would have probably had a much harder time dealing with the pressure waves. I wouldn’t say it was pain-free or comfortable, but I wouldn’t say that it was painful either. It was “intense”. I felt prepared to deal with the PWs knowing that they’d come and go and eventually end. I had expected to be more sedate and of course having more time to relax and turn off my lightswitch like I’d seen in a lot of videos. I am really glad I used the Hynobabies home study course to prepare myself. I have 5 minutes, so I’m gonna post my basic birth story. I would like to say that Hypnobabies really helped my birth to go quickly. First stage was incredibly easy for me. Pressure Waves started on 9/4 at night. They were typical like the ones I have been having throughout my pregnancy. These seemed to wake me up a few times, but I didn’t think much of them. Next morning (labor day) they were still coming, so DH and DS went alone to a Labor Day party. 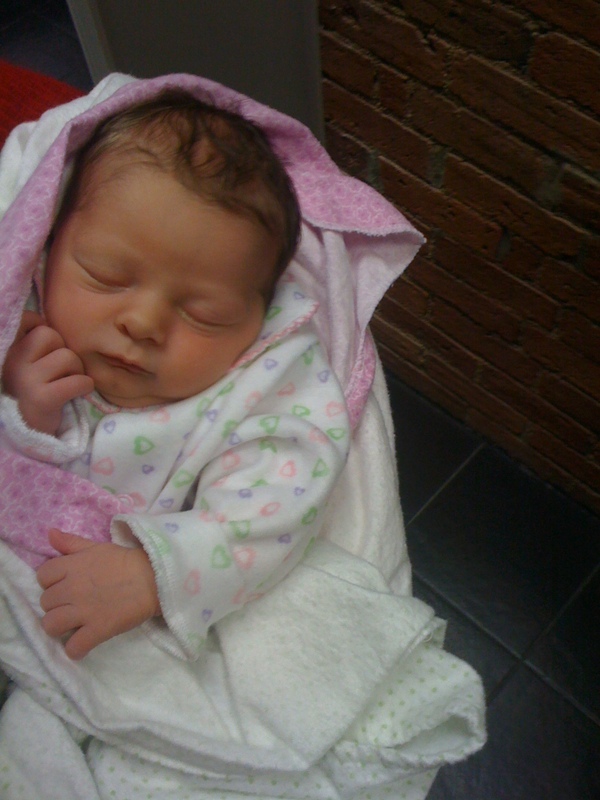 AT 5pm, the pressure waves started getting stronger and lasting longer, so I called the midwife to give her a heads up. I watched a TV show and then headed to bed to listen to my Hypnobabies track. It was nice to get time to myself – even if I was in my birthing time! 8pm is when the pressure waves started lasting a minute or longer and they were 3 minutes apart. I remained calm, imagining my cervix like a gold ring and listening the Hypnobabies “Easy first stage” through my earphone. Pretty soon, the midwife told me she was on her way! DH still wasn’t back from the party, and the birthing tub hadn’t been set up yet. Also, DS had to be put to sleep and I was wondering if he would be able to go to sleep, knowing his little brother might be coming soon. The midwife waited outside until DS was asleep (9:30) and that’s when I also told DH that I didn’t want to be bothered by anyone. This whole time I had been laying in bed listening to the tracks. When the midwife checked me, she seemed surprised that I was already at 4cm. Pressure Waves went on until about 1:00am. They were easy to handle. At 1 they picked up and I started feeling them a little more. They started coming faster, and with a pain in my back. I got into the tub which was heaven! I was coping well, but the babys heart rate was accelerated in the tub, so the midwife had me come out. The midwife checked me and I was 9cm. Everyone there was so surprised! MW told me it was time to push and those pressure waves I was having for the last hour are “pushing” contractions. I had no idea or believe me, I would have been pushing lol! I didn’t think I could do it, and told the midwife that I didn’t want to go on. She said “well, this baby has to come out some way, so you might as well push!” I knew she was right and with all my strength I pushed with the next 3 pressure waves. The following 3 pressure waves, my body was pushing by itself. I told myself I’m not waiting another minute to get this baby born and I pushed the head out. I knew the hard work was done and like I had seen in videos, the body would come wriggling out soon enough. I gave myself a chance to relax and then a minute later DG was here at 3:03 am on Sept 6! The midwife said she was expecting the baby to be born around 7am. 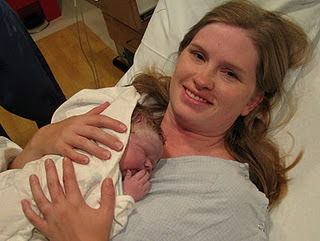 There were 2 other midwives there who told me it was a beautiful, quick birth. I’m so glad I finally got my homebirth. Thank you Hypnobabies! What if Your Due Date is Wrong? Here are two great posts discussing why due dates are not set in stone. Why really it should be a guess month…. a Five Week Window when baby is safe to arrive. How Did Your Hypnobabies Childbirth Hypnosis Classes Help You? We would love for you to share. Not only in your comments here, but by joining a Blog Carnival about the topic of How Your Childbirth Classes Helped You!